On May 19th, the School of Trades and Apprenticeship hosted their first annual Awards Presentation and Barbeque in the Masonry Centre at the Waterloo Campus. Over 200 guests including business owners, industry professionals, faculty and family members watched as President Tibbits, Greg White and Stephen Speers, Chairs of the School of Trades and Apprenticeship presented 71 awards to students in motive power, construction and industrial programs totaling $47,375.00!!!! The Conestoga College Skills Canada team was recognized by emcee, Mike McClements, the Executive Dean of the Schools of Engineering, IT and Trades. Conestoga ‘s team performed very well at the competition this year; Gail Smyth presented the “College Cup” to President Tibbits for being ranked the number one college at the competition! 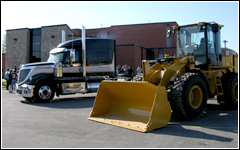 Guests enjoyed a barbecue after the awards presentation surrounded by a Harley Davison heavy truck provided by Altruck International and a piece of the heavy equipment from Toromont CAT not to mention the Conestoga Mustang! Congratulations to the many award recipients for their achievements this past year and thank you to the industry partners and donors for their contributions to the students’ success. Special thanks to all of the Trades and Apprenticeship faculty and staff for their support in making this event such a great success. The School of Trades and Apprenticeship is the centre of apprenticeship and skills training in Canada’s Technology Triangle. Conestoga offers a comprehensive array of programs in Construction, Electrical, Metal Cutting, Industrial Maintenance, Welding & Fabricating, Motive Power and Cabinet Making in response to the needs of industry, and the growth in our local economy. See all the award winners!